Visitors to Nashville will be surprised to find that there is much more to this southern city on the Cumberland River than just country music and the Grand Old Opry. Nashville is home to numerous colleges, and Vanderbilt University has a beautiful campus that provides a scenic and peaceful walk on sunny days. In Nashville, you can also visit the recreation of the Parthenon in Centennial Park, the State Capitol building, the Cumberland Science Museum, and the Country Music Hall of Fame -- quite an impressive lineup of attractions. When most people think of Nashville, the idea of great beer pubs is not usually the first thing to spring to mind, but Nashville has a surprisingly vibrant downtown entertainment district that is concentrated along Second Avenue. Here, the beer traveler can find some exceptional brews to sample. Two of the Southeast’s most well-known brewpubs and an exciting microbrewery are also located in Nashville a short cab ride from Second Avenue. Flavorful, high gravity beers are available in Tennessee at some liquor stores and bars. Be aware, however, that these great beers can be quite expensive -- always inquire about the price before you order one. The brewpubs of Nashville also produce some incredibly tasty products that are well worth seeking out. With all these fine pubs and great beer waiting for us, let’s get going! We begin our Nashville beer experience out near Vanderbilt University in the historic, recently revitalized Hillsboro Village neighborhood. With numerous businesses that focus on arts and crafts, 21st Avenue is the center of this beautiful area of Nashville. With a Hillsboro Village art shop, pottery store, and coffee roasting café present, it seems appropriate that there be a craft-beer brewery as well. Bosco’s has filled this niche with charm, style, warmth, personality (and good beer too). Bosco's is so successful, that it now has other locations in Tennessee. The Nashville Bosco’s is well-known as the first brewpub in Tennessee to open after laws were passed in January of 1996 to allow restaurants to brew and sell beer on premises. The head brewer is Fred Scheer who has done a wonderful job with the Nashville Bosco’s range of award-winning beers. The beers are very noteworthy, and the brewpub is known for its enjoyable events and promotions such as its Sunday Jazz Brunch from noon to 2:30 pm and the "Cellarman of the Day" ceremonies. An honorary cellarman is chosen every weekday at 5:30 pm to tap the current cask-conditioned beer and receive the first pint. Each cellarman is then enshrined in the Bosco’s photo album. This promotion has worked well to educate people about the virtues and pleasures of cask beer. Bosco’s is open 11 am to 2 am Sunday through Thursday and 11 to 2 Friday and Saturday. The beer list includes favorites such as Flaming Stone Beer, Bosco's Bombay IPA, Germantown Alt, Isle of Sky Scottish Ale, London Porter and scrumptious seasonals. Bosco’s is most famous for its Flaming Stone Beer brewed using a traditional German technique of putting stones heated in the wood fired ovens into the beer during the brewing process to provide a unique caramel character. Beer critic Michael Jackson has given this Stone Beer "three stars." The menu at Bosco’s is superb with crawfish cakes, wood oven salmon, black bean and goat cheese tamale, bruschetta, fine sandwiches and burgers, and wood-fired pizzas that will blow away your taste buds. Even though you will be tempted, don’t spend all day at Bosco’s, there are many more stops ahead of you. Blackstone assistant brewer Travis Hixon experiments with oak barrel-aged and cask-conditioned beers. From Bosco’s, grab a taxi for a short ride to the next brewpub on our list. Blackstone is fortunate enough to have the very talented Dave Miller as partner and head brewer. 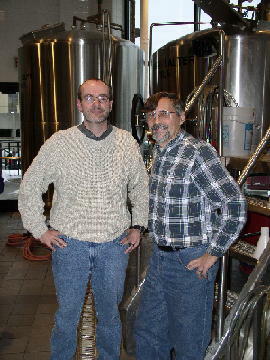 Dave has written numerous books about beer and brewing, and produces all the fine ales and lagers at Blackstone with the valuable help of assistant brewer Travis Hixon. The medals on the wall from the Great American Beer Festival attest to the quality of the products coming from this establishment -- included are a 1996 gold medal for the Saint Charles Porter and a 1997 silver medal and a 2000 gold medal for English Style Brown Ale. The Brown Ale is very nice with a roasted nut flavor and aroma. The Chaser Kolsch, Red Springs Ale, American Pale Ale, and rotating seasonals are outstanding as well. Try a sample of their rotating cask-conditioned ale that is served from an authentic English handpump at the bar. The brew room is huge, sparkling clean, and found behind the front windows that face the street and parking lot. The brewpub has several different rooms, my favorite being a small room across from the bar modeled after a cozy library sitting room. An impressive bottle collection lines the walls at Blackstone, and the dark wooden bar is a marvel of architecture. Three experts in their fields own Blackstone -- Kent Taylor (a C.P.A. ), Stephanie Weins (trained in restaurant management), and Dave Miller (master brewer). Food is very important at a brewpub, and both chefs at Blackstone are outstanding. Hours are Monday through Thursday 11 am to midnight, Friday through Saturday 11 am to 1 am, and Sunday noon to 11 pm. Blackstone opened on December 31, 1994, and this allows them to have a huge birthday/New Year’s Eve celebration each year. With the Nashville Symphony close by, it is not unusual to see people in tuxedos at the bar next to folks in blue jeans -- there’s always a great mix of folks at Blackstone. This restaurant and brewery certainly deserves it status as one of the most respected brewpubs in the Southeast. From Blackstone, take a taxi several blocks to Nashville's Yazoo microbrew facility located in the old brick building that was once home to the Marathon car company. Taproom hours are 2-6 PM, during which time thirsty patrons can sample Yazoo's Amarillo Pale Ale, Dos Perros Alt (with flaked maize and caramel malts), Stout, Porter, ESB, and the extremely popular Hefeweizen that won a gold medal a the 2004 Great American Beer Festival. Food at the Yazoo tasting room currently consists only of tasty cheese and spicy roasted pecans. Yazoo was started in 2003 by homebrewer Linus Hall and his wife. Linus also worked with Garrett Oliver at Brooklyn Brewing Company for a time and gained valuable brewing knowledge and experience from his tenure there. Yazoo's success in Nashville is mostly due to Linus' brewing skills, and the brewery will soon expand to 5000 bbl capacity sometime in late 2006. "We subscribe to the four pint principle -- our beers must be good enough for most people to want four pints of each. Many folks in Nashville were looking for a good, local microbrewery to support, and we make clean beers with good flavors that are easy to enjoy." said Linus. "Before I got into brewing, I thought I was shy, but now I enjoy meeting and talking to everyone about our beer. It has been fun getting to know so many beer lovers in Nashville." "The mothership of all beer joints" is but a short cab ride from Yazoo. The Flying Saucer is part of a chain of ale houses in Fort Worth, Addison, Dallas, Memphis, Little Rock, and Nashville. Located in an old rail station dating from 1900, the Nashville Flying Saucer is a breath-taking, overwhelming pub and pool hall located in the back corner between Union Station Hotel and the Frist Visual Arts building. Hours are Monday through Wednesday 11 am to 1 am, Thursday through Saturday 11 am to 2 am, and Sunday noon to midnight. Monday night is "pint night" with $2.50 glasses of brew offered up to thirsty patrons. The beer menu at the Flying Saucer is truly impressive with over 75 tap handles and 125 bottled selections. This is one of the rare pubs in town that will go to the extra trouble to stock beers that are higher in alcohol (but some can be quite expensive). Outstanding beers on the menu include: Celebrator Doppelbock, Anchor Old Foghorn, Sierra Nevada Bigfoot Ale, Delirium Tremens Ale, EKU 28 lager, Dogfish Head Ales, Youngs Ales, and Chimay. Special theme "Beer Flights" are also offered with each sampler tray featuring five, 5 ounce glasses of each of the beers listed -- customers can choose flights from Britain, USA, or Germany. A selection of cigars is also offered, along with wings, nachos, sausages, and "killer sandwiches." 111 Broadway at Second Ave.
As you exit the front doors of the Flying Saucer, walk left to Broadway and turn right. Walk eight short blocks down the hill toward bustling Second Avenue and the Cumberland River, and you’ll find Big River brewpub on your right. Big River is part of the chain of brewpubs that includes Rock Bottom. The Nashville location is in the middle of the tourist center around Second Avenue. Beers include Southern Flyer Light Lager (the name says it all), 16th Ave. Pilsner (nice Hallertau hops), Nashville Steamer (well-balanced and malty), Metro Nut Brown Ale (slightly light bodied), and Iron Horse Stout (roasty and creamy). This brewpub has a pool room and some of the best food in downtown Nashville. If you are in need of non-liquid sustenance at this point, try the chicken enchiladas or a delicious pizza. Big River is open Monday through Thursday from 11 am to 11 pm, Friday and Saturday until midnight, and Sunday noon until 10 pm. From Market Street, continue walking up Second Avenue to Buffalo Billiards on your right. Opened in 1997, Buffalo Billiards has become a Second Avenue landmark. It has two gigantic floors; with a bar, dart area, and too many pool tables to count on the first floor, and "The Havana Lounge" cigar room (with walk-in humidor) on the second floor. This place is a hot spot at night and has a really nice bar downstairs with cool, comfortable bar stools, and about 12 draft and 12 bottled beers available (many of these are microbrewed selections). The beer is a little on the pricey side, but the pool tables and atmosphere more than make up for this. The food has a Western flare with buffalo burgers, nachos, quesadillas, and steaks rounding out the menu. The crabcake sandwich and grilled portabello mushroom are also very good. Gigantic Western murals highlight the interior brick walls of Buffalo Billiards, and the entire pub is highlighted with elaborate antiques and beautiful furniture and couches -- it’s quite an attractive place. The dart boards are even mounted on wooden planks taken from an old barn just before it was demolished. Stop by Monday through Friday from 4 pm to 3 am, Saturday from 1 pm to 3 am and Sunday from 1 pm until 2 am. The Havana Lounge is open Wednesday to Saturday 7 pm to 3 am. Buffalo Billiards seems to always be alive with people, beer, cigars, pool, and atmosphere. 107 Church Street at Second Ave.
As you leave Buffalo Billiards, walk to the right up Second Avenue until you come to Church Street. Directly below Hooters you will find The Beer Sellar. Known as "Nashville’s Best Tornado Shelter," the Beer Sellar is a great, casual, basement pub for beer, fun, video games, pool, and relaxation. Pop in for a pint Monday to Friday from 2 pm to 3 am and Saturday and Sunday 12 pm to 3 am -- with "two-for-one" beer all day on Sundays. There is live music every Thursday 9 pm to 1:30 am, and the menu has good sandwiches including roast beef, turkey, ham and cheese, and pastrami. Around 50 draft beers are at the Beer Sellar with nice imports and ciders highlighting the list, and over 150 bottled beers make this pub one of Nashville’s best beer destinations. Cigars are for sale at the bar, and be prepared for a very smoky atmosphere here. Open since 2003, this funky pub with a big front patio is a short cab ride (or long walk) across the river from Beer Sellar. It is located in a gentrified neighborhood in east Nashville and offers 25 drafts and almost 50 bottled beers. There are also two dart boards, three pool tables and vintage video games for the enjoyment of the customers. The food menu offers quesadillas, pizzas, sandwiches, wraps, burgers and a vegetarian section. Just around the corner from Beyond the Edge you'll find the cool 3 Crow Bar. This pub has 25 drafts (including examples from Yazoo, Flying Dog, Terrapin, etc. ), darts, a big bar area and friendly staff. Sandwiches and pub grub is offered, and live music is featured on most Saturday nights. The pub started in 2004, and the name of the pub has interesting origins (ask the bartender). A quote from Jack Nicholson is proudly displayed on the wall -- "Beer, it's the best damn drink in the world." Many in Nashville seem to agree..